- The border around the Tree tells a fascinating story. It begins with Celtic knotwork at the bottom, symbolizing paths toward growth, a journey. The vines at the corners represent Mother Nature influence, and are followed by animals, and finally humans. 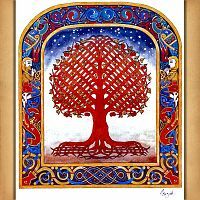 The peacocks near the top carry souls to heaven after death, and the heavens themselves are filled with brilliant spirals, symbolizing both Nature as a whole, as well as the Spirit and the Mind. Pattern is based on artwork by Cari Buziak. the design measures 332 stitches wide by 380 stitches high. 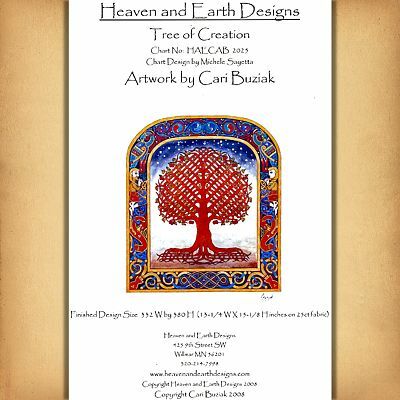 Copyright - Heaven and Earth Designs, Inc.
Do you have any other questions about our Tree of Creation Cross Stitch Pattern?